While most people think of the multimeter as a tool that can only be used by technicians and electricians, nothing could be further from the truth. That’s because while this device is used by a wide assortment of professionals, it’s also quite helpful for the average homeowner to keep around the house and can be used for a variety of uses in the home. Finding out that these devices are useful is only half of what needs to be considered, however. 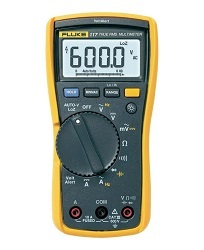 Discovering the best multimeter for their needs is another important consideration. Which is why I’ve gathered together ten of the best multimeter models today. So, that homeowners and DIY enthusiasts can find one that fits their particular needs. This Sino meter is a model that can be used in both auto and manual modes and comes packed with quite a few useful features. One of these features is an LED and sound warning that alerts the user when incorrect jacks are used to relative to the function switch setting. Another useful feature that can be found on this device includes an auto-power off feature that keeps the batteries from being worn down when the unit isn’t in use. This unit operates on three AAA batteries and comes with both test leads and a user manual which explains the operation to the user. This unit is very useful for keeping on household electrical maintenance and can be used for a variety of purposes. It can be used to measure both AC and DC current, and can also be used to test diode positive voltage, resistance and to trouble problems with circuits safely and securely. This makes this an ideal tool to be used by both professional electricians, technicians and do it yourself enthusiasts. This model operates using three AAA batteries and comes with a number of useful accessories which include a carrying case, a user’s manual and a pair of test leads. Designed to meet both IEC61010-1 safety and CAT II 600V measurement standards, this meter is a useful addition to just about any homeowners box of tools or any DIY enthusiasts workbench. It can measure both AC and DC voltages, as well as continuity, frequency, resistance, and diode voltage. It has a fairly big LCD display that shows the readings clearly and has several function settings which include function switching, data hold and maximum value hold. This meter also has an auto-power off function which turns the unit off when it’s been idle for 15-minutes or longer to conserve battery power. This meter is sophisticated enough to be used by tech professionals but is simple enough to be operated by just about anyone. This unit has a built-in clamp that allows AC voltage to be measured without the user putting themselves in harm’s way. It can also be used to test DC voltage, as well as continuity, resistance, and diode functions. This meter has a capacity of 400 amps and has several features which include data hold, max reading, and a 15-minute sleep mode. It also has a large LCD screen that allows the unit to be easily read white testing. A useful tool for everyone from an entry-level electrician to a hobbyist, this voltmeter has many of the functions found in more expensive Ohm-meters. it can measure AC and DC voltages and can measure capacitance, frequency, resistance, and duty cycle. It can be used to test a variety of circuits, transistors, and diodes and can provide the information on its LCD display. Other features which can be found in this model include a low battery voltage indication, a data hold function and overload protection for all ranges. This makes this an ideal meter that can be used on a day-to-day basis. With a 200KHz Frequency Measurement and 2000μF Capacitance, this unit is useful for a variety of projects and is sure to make itself useful for not only technical and academic work but also amateur work as well. It can accurately measure resistance, voltage, current and a lot more by using either the test lead, the banana clip or hooking it up via the banana clip to alligator clip cable. Other features which can be found on this device include overload protection, a large back lit LCD display, and a nice protective outer shell that helps it hold up to being dinged or dropped. This meter can be used to troubleshoot all forms of electrical problems, both around the home and around the car. It’s easy-to-use and safe to operate when used according to its specifications and instructions and can be used for not only measuring current and voltage but also continuity and resistance as well. It has a large back lit LCD display that’s easy to see, even in poorly lit areas, and has a sampling speed of 2-times per second. Other features which can be found on this unit include overload protection, a built-in kickstand so it can be used hands-free and a clearly marked range switch. This meter is not only useful for electricians, hobbyists, and DIY enthusiasts but is also suitable for general household use. As a result, it has a number of features which make it useful for all kids of different projects. It can be used for not only testing AC and DC voltages but can also be used to test frequency, capacitance and resistance. Some of the features which can be found in this particular meter include a large LCD screen with a back-light, a maximum display of 6000 counts and Ture RMS. This unit also has an NCV function and comes with a pair of test leads, a user manual, and a k-type thermocouple. This high-quality meter is a professional solution that’s used by hobbyists and electricians all over the world. It’s ideal for use with demanding electrical settings such as what can be found in commercial buildings and hospitals. This unit features an integrated non-contact voltage detection that’s pair with an Auto V/Loz function, that prevents inaccurate readings that can be caused by ghost voltages. Other features which can be found on this meter include a large LED back-light that allows it to be used in low light conditions, True RMS and automatic AC/DC voltage selection. This American made meter is designed to provide the user with the most accurate results possible, which makes it the ideal model to be used by electricians and other professional technicians. It can measure both AC and DC voltages and current, as well as resistance, temperature, and capacitance. Other features which can be found in this meter include an auto-ranging feature, auto-hold, data hold, and a low battery indicator. This unit also has a 6000 count display, an auto power-off function and is designed to be durable, even for day-to-day use and can even bumps and small drops without breaking.